Throughout life at some point or another we have all allowed outside influences to control our happiness. The relationship we’re in, our friendships, our jobs, our financial status and the list goes on. We give so much power to conditional beings, to conditional things. Your relationship breaks down and it is as your life has ended, you loose your job and you see no way back, friendships break down and you feel lost. Our happiness shouldn’t be determined by others or situations but by ourselves. Your relationship ended but let’s all be honest it’s not the end of the world, you can love again if you allow yourself to, you will love again. There are plenty of jobs out there, your skills and capabilities haven’t changed so apply yourself and you will find a new job. You lost a friend, was this person truly a friend? Is it even a loss? What about all the other amazing friends you have that you’ve probably neglected. Sometimes things are removed from our lives to open the door to new opportunities or simply because it was not for us. Times change, people change, situations change. You can not base your whole happiness on such things, things which have no guarantee of being permanent. No situation should be able to determine whether you get out of your bed in the morning, no one should hold the keys to your happiness but you. Happiness starts and ends with you. Do not put that burden on another being to make you happy. It’s not fair on them or yourself. Take control of your life, take back the keys you have so freely given away. Once you learn how to be genuinely happy for yourself your life will be amazing. You’ll wake up in the morning and smile for no reason other than the fact you chose to. Everything is a choice after all. Be grateful for what you have, all you lack will be taken care of. 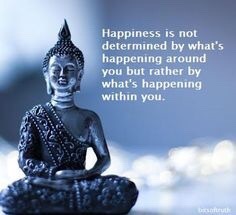 Happiness starts with you.. What determines YOUR happiness? Next > It’s been awhile..